The economic volatility of the last decade has taken a toll on education at every level; the humanities in general and language studies in particular have suffered far more than STEM subjects; and among languages, Greek and Latin, which offer no immediately profitable benefits, feel especially vulnerable. Many of us feel this concern instinctively and find that anecdotes from around the country reinforce our concerns. In addition, three national organizations have published large-scale reports that each offer a different snapshot on the state of undergraduate education. 276 institutions had departments of classics in 2012–13, with an average of 7 faculty members, for a total of 1,920 faculty members. 4,770 juniors and seniors had a declared major in classics at the beginning of fall semester 2012, an average of 17 per department. The average number of majors was highest (32.1) for schools where the highest degree offered is the Master’s. The average number of majors in baccalaureate institutions was 13.6, and in doctorate-granting programs 23.7. 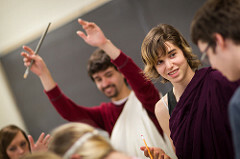 2,240 Bachelor’s degrees in classics were awarded in 2012–13, an average of 8.1 per department. For comparison, Philosophy departments were also first surveyed in 2012–13; they number 754, with a total of 7,830 faculty members. They average 27 junior and senior majors per department, and the greatest concentration is in research universities (18 majors per department); Baccalaureate and Master’s-degree institutions averaged 8 and 9 majors per department, respectively. 9,850 Philosophy Bachelor’s degrees were completed in that year, with an average of 13.1 per department. Second, the SCS surveyed departments during Academic Year 2013–14; this study showed that approximately 190 majors graduated, a fact that suggests that the number of departments responding was smaller than the number in the AAAS survey. The average number of graduates per department in that year, however, was very close to the AAAS number: eight. There were somewhat more women than men, and on average fewer than two minority students, a disturbingly small number and an ongoing concern in every aspect of our discipline. Both of these studies are interesting, but it is the annual survey of enrollments by the Modern Language Association where we find the most longitudinal data, stretching back to 1958. Their periodic surveys of language enrollments first included Latin and Greek in 1968; surveys of the twenty-first century, in 2002, 2006, 2009, 2013, show that Latin enrollments reached a high of 32,444, reported in 2009, and fell to a low of 27,000 in 2013. The latter number is comparable to the numbers for each survey in the 1990s. Greek, on the other hand, had the highest enrollments during the years surveyed—22,800—in 2006, only to plummet to fewer than 13,000 in 2013. The SCS survey includes numbers for various courses in classical studies; there is no long term data for comparison, but the enrollments seem relatively healthy—something that my own observation supports. It seems that, while we can’t be complacent about Latin or Classics enrollments, it is Greek where we have good reason for concern. With that background, I’d like to look at ways that course offerings and pedagogical approaches have undergone changes in the last decade or so, and I’ll tackle course offerings first. The SCS census asks about Ancient Art & Archaeology, Ancient History, Ancient Philosophy, Classical Civilization, Literature in Translation, Mythology, and Etymology—all titles, at least, that are familiar since my own undergraduate days. Two newer areas of focus appear as well, the Classical Tradition and Gender & Sexuality Studies. Where twenty years ago, for instance, a forward-thinking department would offer “Women in the Ancient World,” focusing on texts and inscriptions, say, today such a course reflects a theoretical sophistication that we would also find in a department of Gender and Sexuality. Similarly, as Classical Reception has emerged as a field of study, at the same time Classics courses that look at the afterlife of ancient models become more sophisticated as well. Under even familiar headings, too, it’s very likely that the emphases and pedagogical strategies are new ones, and the same is true in language courses. I will simply call attention to some examples. Perhaps a dozen or more programs use Latin as the language of instruction—in whole or in part.1 And summer opportunities for practicing the active use of Latin are flourishing (see below for a list of Conventicula). Comparable programs for Greek are emerging more slowly. Distance learning opportunities make it possible for programs to address larger audiences and in turn draw on a larger pool of offerings for their students: Synoikisis, a national consortium of Classics programs, is one very successful example. Role-playing and gaming as instructional strategies can assume a variety of forms; in 2015 the SCS meeting included a panel of instructors who employ an array of such techniques. The Reacting to the Past project consists of elaborate games, set in the past, in which students are assigned roles informed by classic texts in the history of ideas. Classicists have been involved in this project almost since its inception. The importance of new teaching strategies, especially for Greek, was a lively topic on the Classics list earlier in January, prompted by James Romm’s article in last Sunday’s NY Times: “Beginning Greek, Again and Again.” His reflections on the inevitable frustrations that attend the joy of teaching Greek struck a nerve with many of us. At the same time, all the numbers we looked at above tell us that we need desperately to address declining Greek enrollments. Two themes emerge in discussions of that decline. One arose in that recent online conversation: the need to improve pedagogy in Greek. While examples of the innovative practices more widely adopted among our high school colleagues appear in some college Latin programs—the use of Latin in instruction, for instance—they are far less frequent in Greek. A strategy cited for its potential benefit is the use Comprehensible Input, that is, providing students with readings that are readily intelligible in order to increase their fluency. Again, far more materials are available for Latin than for Greek. A second challenge facing Greek teachers has been raised by Willy Major of the Committee for the Promotion of Greek, and is echoed by others: As student demographics change, the study of Greek once again—still?—is perceived as a bastion of privilege removed from and absolutely unrelated to current concerns, and this perception persists to an extent that is not the case with Latin. This fact argues not only for new teaching but also for new entry points, perhaps, into its study. Students of engineering can be introduced to Archimedes, for instances; students whose tradition focuses on the Ottoman Empire need to know who founded Byzantium. As an example of the kinds of changes that are taking place in teaching strategies and in content, I’ll take my own department at Wake Forest, the one I know best. From 1988 to 2008, there were four of us, good teachers all, but not, in general, engaged in pedagogical innovation. Since then three retirements have made us a department of teachers from a generation who have been engaged in questions of pedagogy in ways my age mates and I never were. My colleague Michael Sloan, for instance, is developing a repository of online Latin drills that can provide the out-of-class backbone for one kind of flipped class, where class time focuses on reading at sight. My colleague Ted Gellar-Goad turned a required course for Latin majors—Advanced Grammar and Composition—into an elaborate role-playing game. His First Year Seminar combines two Reacting to the Past games, one set in Athens in 403 and the other in Rome immediately after Caesar’s assassination. John Oksanish developed an FYS called “Ancient STEM Societies.” Selena Witzke is designing digital portfolios for her course on women in the ancient world. One of our most ambitious initiatives is still in the planning stage. Like many institutions, we see a growing number of students who are exempted from the language requirement for reasons of ability; large numbers of them are student athletes, first generation college students, and new Americans. In the case of some students, their disabilities are insurmountable, but perhaps that is not true for all of them. We hope to pilot an alternative Greek sequence that will be open only by recommendation from the dean’s office or the learning center and that will teach not only the Greek language but study skills, linguistic awareness, and more. At the same time, we hope that these students will gain confidence in their ability as learners. We’re very excited.